The Newfoundland is a lovable, peaceful, and relaxed breed that makes for a wonderful companion. The breed does have some protective instincts when it comes to family. The Newfoundland requires daily physical activity to stay healthy. These needs can be met through a walk or an active play session. This breed has a natural affection for water. The Newfoundland prefers a cold to mild weather environment and does not thrive in warm to hot weather. This breed is best suited for a living environment that includes access to the indoors and the outdoors. In regards to being indoors, the Newfoundland needs adequate space due to its large body. The coat of the Newfoundland requires combing two times each week and possibly more during times of shedding. This breed has a tendency to drool. The major health concerns for the Newfoundland are SAS (sub-aortic stenosis), cystinuria, elbow Dysplasia, CHD (canine hip Dysplasia), and gastric torsion. There are several minor concerns as well that include OCD (osteochondritis dissecans), entropion, ectropion, vWD (Von Willebrand’s Disease), cataracts, and cruciate ligament rupture. Epilepsy is occasionally seen in this breed. It is suggested that the hips, elbows, cardiac system, and eyes be regularly tested. The average life span of a healthy Newfoundland is 8 to 10 years. The Newfoundland can have sensitivity to anesthesia. The Newfoundland breed earns its name from its place of development. There is disagreement about the actual origin of this breed. The Newfoundland has some roots to the Tibetan Mastiff, but there is no evidence that the Tibetan Mastiff had been in Newfoundland at the time. Another theory still follows the belief that the Newfoundland was derived by the Tibetan Mastiff, but by the way of the Great Pyrenees. At Roougnoust in 1662, a colony existed that contained Great Pyrenees dogs. The English settlers had English retrievers which were eventually crossed with the Great Pyrenees and it is believed that the Husky may have also been introduced somewhere in this process. The result was the creation of a new large breed that loved to be in the water and was tolerant of cold weather. 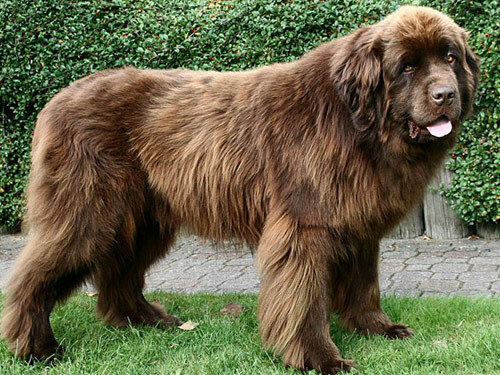 This new breed became known as the Newfoundland after an individual dog of that name. This breed quickly established itself as water dog with the ability to drag fishing nets through the water and also save the lives of those in water. On land the Newfoundland served several purposes as well, including a draft dog. Europeans became so interested in this breed that they took it back to Europe and began to enter it into the show ring. This breed became less visible in the location of Newfoundland as many of the dogs were being exported out and the law restricted people in Newfoundland to ownership of one dog only. The breed continued to gain attention in England until World War II ended and the Newfoundland found a new role in America replenishing English stock. America and England have completed their recoveries and the Newfoundland remains popular in both countries. The Newfoundland is usually known for having a black coat color, but there are black and white versions as well.